Could you explain to The Monthly’s readers how you became involved in architectural heritage? My parents, particularly my father, a pharmacist who was a frustrated archaeologist, had a real interest in history and the arts. They always took us on holidays to places where we could explore historic buildings. This fired my imagination as a child. I was always sketching buildings for my school art projects. Did you continue your interest in historic buildings through to higher education? Not initially. When I went into higher education, I studied English and French to begin with, and then switched (quite an about turn) to study Urban Planning at the Edinburgh College of Art. After that when I returned to live in Northern Ireland, I was lucky to get a work placement with Rachel Bevan Architects in Downpatrick. She and her husband, Tom Woolley (then Head of the School of Architecture at Queen’s) were passionate about creating sustainable architecture, mostly through the re-use of existing buildings. That was a wonderful introduction to the world of satisfying work. I volunteered, and was subsequently employed by, the Ulster Architectural Heritage Society, where, for over 10 years, I pressed for the retention and re-use of our dwindling stock of historic buildings. You were involved in a campaign to save traditional red brick housing in The Village? I became increasingly concerned with standing up for vulnerable historic streetscapes – the extraordinary in the ordinary. Together with the marvellous Marcus Patton, Director of Hearth Housing Association, I got involved in a public inquiry in 2009 to defend the traditional red brick terraced houses of The Village area of south Belfast. This designated Area of Townscape Character was to be demolished in an Urban Renewal Area scheme led by the then Department for Social Development. I would say here that trying to save buildings is a fruitless exercise if the local community is not behind the argument – people must come first. Some residents from the Village approached UAHS to let us know what was happening and to enlist support. In this case you had local support? Not really. A woman called Louisa Blackburn from Soudan Street, with the help of a DSD grant, had just restored her terrace house in the Village beautifully, keeping all its original features. She wanted to stay in her home, but was ultimately forced to leave. She was unique in some ways because to many others in the area, the older buildings were viewed as beyond use, and so they fought to have them replaced. They won the argument. I became as interested in the dynamics within the community, as in the buildings that I had set out to try and conserve. In many ways, communities are in danger of losing their identities and sense of themselves with the demolition of the historic buildings – the tangible links – that reveal so much about the place and its past. When these areas (and people) have not benefited from investment in their fabric, it is understandable why historic buildings are perceived to be past their best, become blighted and then redeveloped. Given your background how do you see the development processes being pursued in Belfast at the present time? While we can point to many good recent examples of re-use like the Ormeau Baths building and the investment in Templemore Baths, there is still a tendency to pursue the headline grabbing (often new) landmark projects, instead of investing in, and making the most of, what we’ve got. Regeneration funding would be best spent on our special places with stories to tell, like the 9,000 listed buildings and over 60 conservation areas, spread across Northern Ireland. Only £300,000 was made available by DfC for listed building repair this year, which doesn’t really register in the very fabric that tourists want to be surrounded by. Are there any cities which are worth emulating with regards regeneration and sustainable development? Scotland is leading the way with its Conservation Area Regeneration Scheme, which draws attention back to the high streets, animating empty shops, populating upper floors, celebrating distinctive detailing and creating handsome and robust public realm. This is how we create prosperous places where people want to linger. We lose our unique sense of place at a price. Even the British Retail Consortium has prioritised its focus on heritage assets in its ‘21st century High Streets’ manifesto, as a way of getting online shoppers back out onto pavements. Decision makers need to fix their eye on the long-term, carefully creating places with a heart and soul, where people wish to live and take pride in, not just follow the money. Belfast’s city centre, including the Cathedral Quarter, is being undermined with the short-term in mind. The demolition of the sound and substantial 1930’s Co-Operative Department Store (which I had tried to get listed a few times while I worked at UAHS represents a worrying, wrong-headed approach to regeneration. The demolitions on Upper North Street were a shocking, sheer waste too. We are killing the goose that laid the golden egg by losing the buildings that make Belfast, Belfast, rather than Anywheresville. A more confident city would appreciate this, value its historic buildings (listed or not), hold its nerve and simply say ‘No – that’s not good enough’. The ‘anything goes’ approach fails us all in the long term. So what about the Red Brick Belfast project? How did you become involved in that? 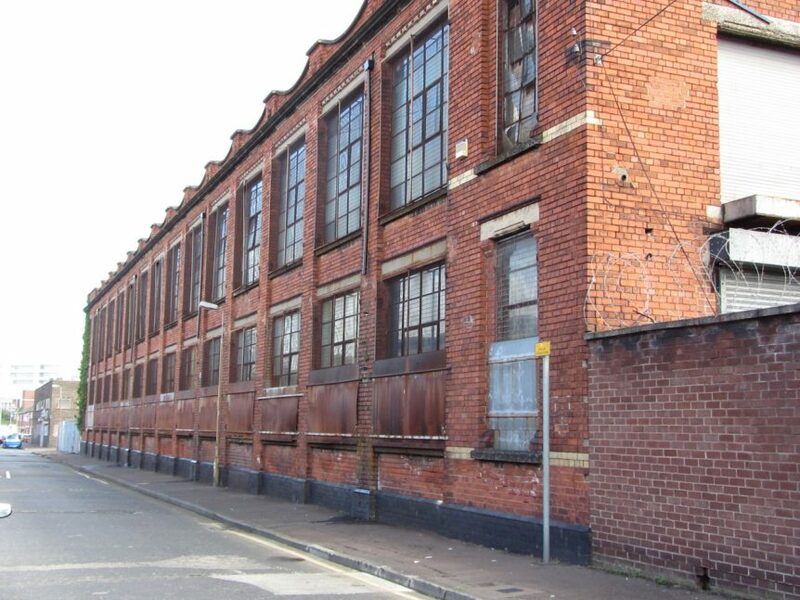 This emerged out of my experiences in campaigning in the public inquiry where we tried, and failed, to convince government that the sound buildings within the red brick terraces should be maintained in the Village area of Belfast. This demolish and rebuild approach has been going on since the 1960s, but, as another architect put it at the Inquiry, dentists from that era used to remove all of your teeth, when only one needed to be extracted, whereas now they strenuously try to save what they can. Sadly we failed to win that campaign, and when I went down to The Village to film the demolition of Louisa’s house very early one December morning, I noticed a group of young men gathering up the red bricks for sale. While they were clearly motivated by the idea of making a few quid, their resourcefulness got me thinking about how we could harness some of that energy, to connect with and establish, whether they might begin to value the area’s threatened heritage. So you connected with the local community? 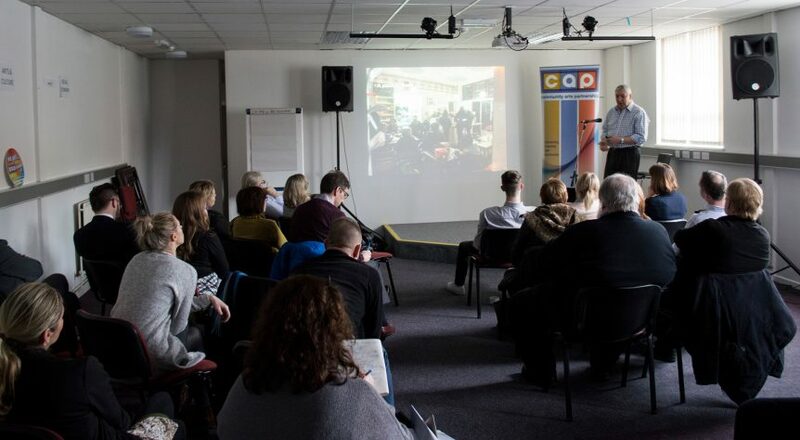 I gave a presentation shortly afterwards which picked up on the Village campaign, where I met Conor Shields from Community Arts Partnership, and we discussed whether we might do a joint project, entitled ‘Red Brick Belfast’, using the arts to shine a light on the complex issues involved in the case. We linked up with the Greater Village Regeneration Trust (GVRT), who became our locally based project partners. They wisely suggested expanding the target audience of young men to include older women from the area, developing an inclusive, intergenerational project. We applied for funding to the Heritage Lottery Fund’s Sharing Heritage programme, which was a great fit, as we sought to expand people’s horizons, investigating heritage in a different way from what might normally be considered cultural heritage in this proud, loyalist working class area. We wanted the project to have depth, as well as be fast paced, and we especially wanted to be able to keep everyone engaged, so we brought in a wide range of experts over the 12 week project. We worked with an historian and archivist to investigate local maps and records; an archaeologist to explore the city’s brickworks, a ceramic artist to show the group how to make bricks, a conservation builder to guide the group as they repaired historic brick work, a conservation architect to show how terraces can be restored and upgraded, and a skilled videographer to record all the activities, as well as teach the group some camera skills. We also worked with an artist, Carole Kane, to help draw the group together and work closely as a team. What buildings did the group work on? Given that the best of the traditional terraced houses in the area had been demolished, the listed and empty red brick Rydalmere garment factory became the focus of the project and we were thrilled when the owner agreed to give the group access to the site including access to film there. What were the theoretical underpinnings to the project? Apart from those I have already outlined, we wanted to investigate the reasons why we had failed to win the campaign to save the red brick terrace houses. 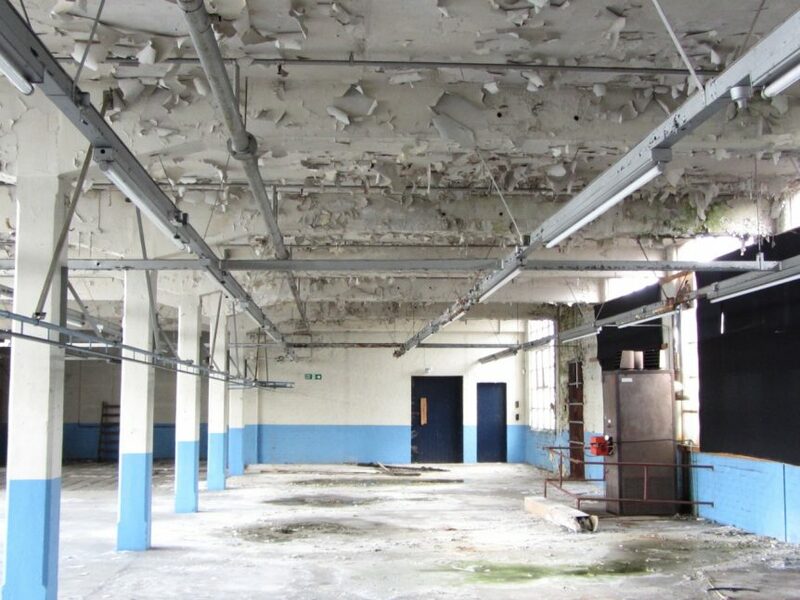 I doubted that there had been any real investigation of alternative approaches – where the buildings could be refurbished; act as a vehicle for change; add to community cohesion and grow employment opportunities. I had been told that the local residents wanted the terraces to be demolished as part of the Urban Renewal Area scheme so behind the project then, there was the desire to test the assumption that local people didn’t care about their built heritage and were content to see it demolished. There was the lurking question of differing values and value systems. How did you go about investigating those ideas? We wanted to draw attention to what was happening in terms of regeneration outside the Village and took the group to look at the McMaster Street terraces and Templemore School, to show that them that adaptation and re-use is a viable and highly desirable option for creating housing, workplaces and community facilities. The hands-on work at Carnegie Oldpark Library reinforced the reality of green collar job opportunities, and speakers we brought across from the Homebaked Co-op in Liverpool and Giroscope in Hull inspired us all about the social benefits that can be felt as a result of creative and thoughtful interventions. How did the participants react? When we took the group to the Rydalmere factory, they were really taken aback at the quality of the spaces and the building’s condition. The visit sparked off all sorts of ideas about the roles the factory could play for the community and the owner. What were the outcomes of the project? 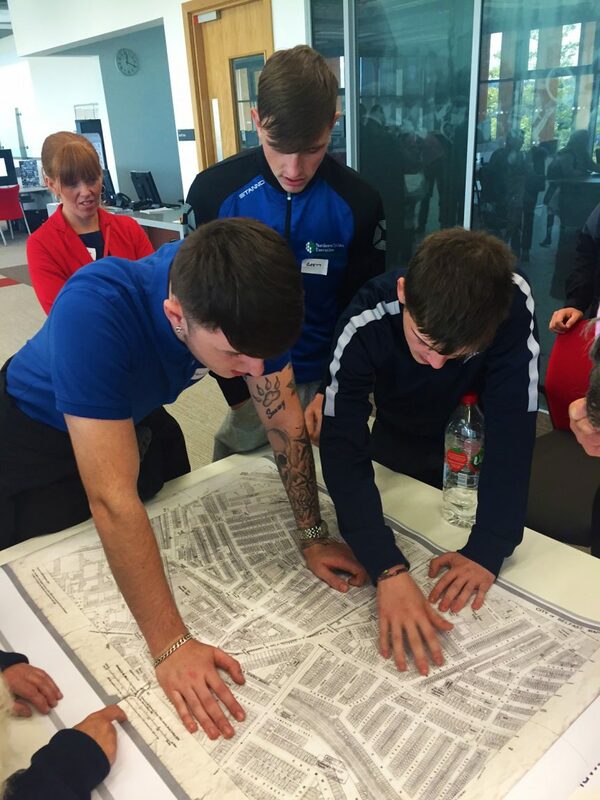 It was wonderful to see how people reacted to the sessions, and especially rewarding to see the young men start to open up and develop their own ideas for their area. They all began to imagine the potential for the remaining heritage in the Village and they started to understand that the skills that were needed could be learned. And that they could be part of that process. One of the young men’s journeys offers a really encouraging example of how transformative the project was for some participants. In the short film that was created at the end of the project, he says that he would like to be an architect and create something that the community could use to its advantage. I think it would be fair to say that this would have been inconceivable at the beginning of the project. This participant was offered work experience at Clanmill Housing Association’s Heritage Division as a result of the project. The intergenerational elements of the project were a great and surprising success, with real friendships being forged between the young men and the older women, and other projects for both audiences being designed by GVRT as a result. We believe the project was nominated for an award? Yes, that’s correct. Red Brick Belfast was nominated for a Best Contribution to a Heritage Project by Young People at the Andrew Lloyd Webber Foundation’s Heritage Angels award in November 2017.